A survey of economists by the Monetary Authority of Singapore (MAS) found that the average expected Singapore GDP growth rate for 2013 stands at 2.3%, which is slower than the figure of 2.8% quoted in March. On the other hand, inflation for the year is expected to come in at just 2.8%, which is lower than the central bank’s forecast of between 3 and 4%. The lower inflation figure suggests that rising prices are less of a concern this year, following high inflation of 4.6% in 2012 and 5.2% in 2011. Despite the below-target inflation numbers, they still lie above historical trends. Francis Tan, an economist at United Overseas Bank (UOB), said in an interview with Reuters that he expects the half yearly policy MAS policy statement in October to remain largely the same because of the high inflation rates. The MAS release also mentioned that expected core inflation, which excludes housing and private car prices, is at 1.8% as opposed to the previous estimate of 2.0%. 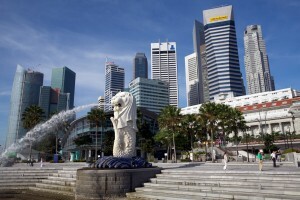 Singapore experienced better-than-expected GDP growth in the first quarter of 2013, partly because of a surge in financial services boosted by stock and foreign exchange trading. Economists are skeptical, however, about the economy’s ability to sustain this surge. Despite this, the economy is expected to do better than last year’s growth of 1.3%, driven by both financial services and construction. Singapore lifted a goods and services tax on investment grade precious gold and precious metals last year to boost the city-state into a gold trading hub. The increased number of Ultra High Net Worth clients in the region makes this asset class an increasingly popular mode of investment and risk protection. Amazon recently announced that it would start free shipping to Singapore for customers who order at least USD125 worth of goods. This has worried some local retailers who fear that Amazon could take away significant market share because of its competitive prices. As it stands, however, only goods sold directly by Amazon, such as books, music, movies, and selected electronic goods. AsiaOne quoted a PayPal study which said that Singapore’s e-commerce market grew from $1.1 billion in 2010 to $1.4 billion in 2011, and is projected to hit $4.4 billion by 2015. This move by Amazon could be a seen as an attempt to grab a bigger portion of the rapidly growing pie.